Shelley Baranowski, the author of Nazi Empire, discusses German nationalism and the rise of the Third Reich. Yet because of the extraordinary violence of the Nazi regime, which culminated in the Holocaust, German history has usually been studied apart from the broader history of European empires and imperialism. 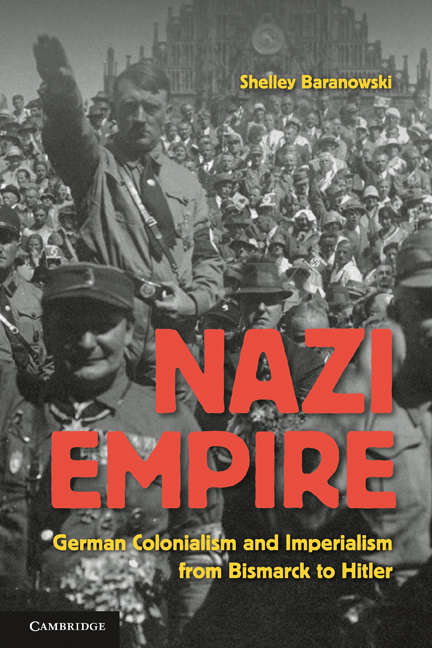 In Nazi Empire, I argue that Nazi imperialism was distinctive—and still it was imperialism. Rather than pursuing an empire that coped with ethnic and religious diversity, which characterized empires historically, the Nazis grounded theirs in the principle of racial homogeneity. Nevertheless, the Nazi determination to acquire “living space” to enable the biological cleansing and survival of the German Volk arose from the comparisons that Nazi leaders drew between their own aims, those of their contemporary imperial rivals, including the United States, and empires of the past, especially imperial Rome. In addition, in imperial fashion, Nazi leaders claimed that an expanded German Lebensraum or “living space” in eastern Europe would anchor Germany as a world power. This would avoid what the Nazis perceived as the fatal weakness of previous German empires, the insufficient commitment to racial purity. My teaching had a lot to do with the conceptualization of Nazi Empire. I teach a course on Nazi Germany in which I usually assign to students the controversial book by the German-Jewish political philosopher Hannah Arendt, Eichmann in Jerusalem: A Report on the Banality of Evil. Arendt’s argument that the distinctiveness of the Holocaust owed less to the long history of anti-Semitism, and more to Nazism’s determination to eradicate “human diversity as such” has always fascinated me. 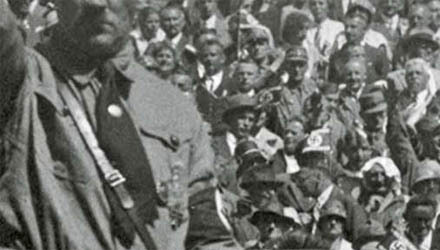 Although German and Nazi anti-Semitism, which fed upon prior religious and secular influences, was obviously central to the Third Reich, the Nazi regime’s comprehensive plans for the racial reorganization of Europe testified to its compulsion to engineer a purified new order that subordinated, expelled, or eliminated those who were not racially or politically compatible. To be sure, the practical demands of fighting a war against Germany’s enemies interfered with racial purification. For example, the Nazi regime needed labor desperately, and that meant drafting millions, racially “suitable” or not, from the occupied territories to work in German factories and farms. The military reverses that Germany suffered, beginning in the fall of 1941 in the Soviet Union, meant that plans for German settlements in the east were inevitably postponed. Regardless, even though the Third Reich never completed its murderous vision, the destruction that it left behind testified to the profound impact of its racial agenda. Other works that have influenced me include that of the Australian historian Dirk Moses who highlights the connections between imperialism and genocide, as well as Frederick Cooper’s and Laura Ann Stoler’s pioneering anthology of the 1990s, Tensions of Empire. The contributions to the Cooper-Stoler volume suggested that European imperialism and colonialism resulted less from a confidence in European superiority and more from the insecurities arising from the tenuousness of colonial control. In addition to applying the insights in Tensions of Empire to the relationship between German colonizers and indigenous peoples, I’ve also found useful Cooper’s and Stoler’s awareness of the instability of imperial rule in conceiving of an additional “tension” that characterized German imperialism. That was the unresolved conflict between the ambition to expand and the fear of defeat by imperialist rivals, whom the mythical “Jew” personified.